My brides from all over the world choose Oahu as their wedding destination for good reason. For over 15 years, I’ve met brides from Canada, Europe, Asia, Australia and even Russia. On an average, I will have styled at least 3 brides a week from another country and they all have one thing is common. 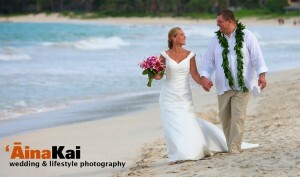 They’ve chosen Oahu as their destination wedding for the convenience and beauty that the Hawaiian islands has to offer. It’s a service-oriented island which most people find out that they can book anything and everything their heart desires, yes, even a small or large wedding. The island’s magic are constantly being captured in the hearts and the photos of the bridal party. Plus, everyone wants a beautiful backdrop of a perfect wave, waterfall or beaches of the islands. That’s were I come in, I know most destination wedding spots and offer suggestions on bridal makeup and hairstyles conducive to time of day, lighting, location and weather conditions. All the while, keeping in mind the bride’s comfort level; in order to meet her goals. My destination brides are always relaxed and come armed with lots of sunscreen to avoid any skin problems. So if being ” in the moment” and enjoying your wedding with spectacular photos is something you long for check out Hawaii as your destination to say “I do”.